Today, our friend Jessica, from Cozy Traditional Home, is here to share this Jolly Old Saint Nicholas Scrap Fabric Craft. If you haven’t seen some of her previous projects, you can see more here, Fabric Scraps Pot Holders or here, Scrappy Denim Boho Necklace. We have always celebrated St. Nick’s day with our family. It’s part of our German heritage, and this year will be no exception. 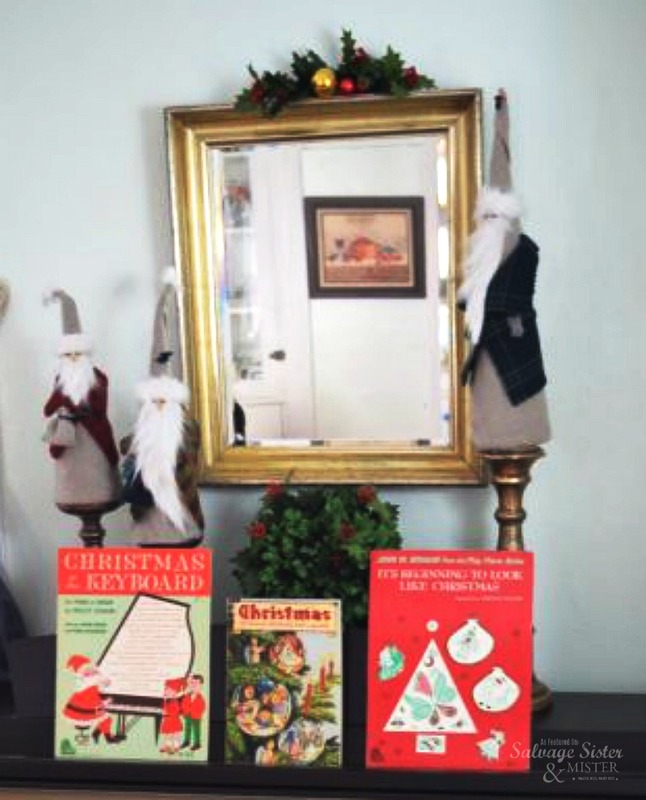 I had fun making these crafty, old fashioned St. Nick’s to add to our Christmas decor. They are easy and inexpensive to make with the addition of a few extra supplies from the craft store. 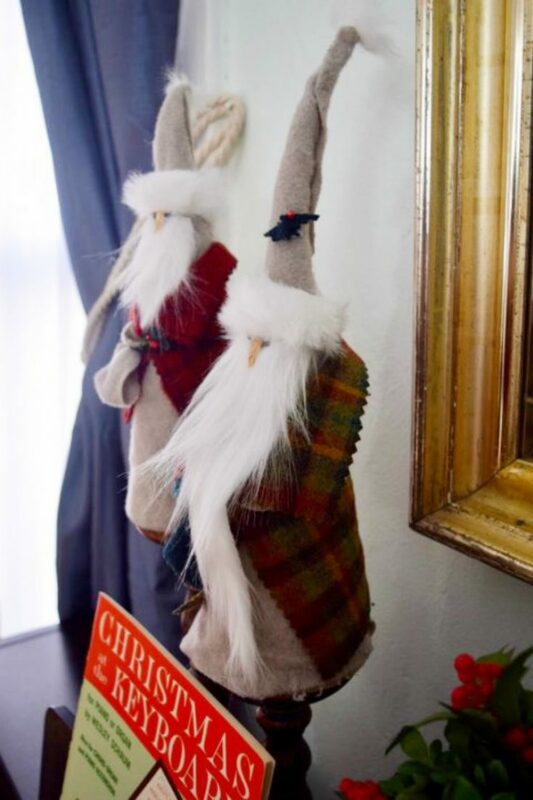 These little St. Nick guys are made from cardboard tree bases and covered with wool. My wool scrap bin came in handy and I was able to adorn them with little robes, patches of fur trim, and pouches for holding gifts. The eyes are made from stick pins with dark colored heads, the nose from a wooden piece of herb (astragalus root) which has been in our spice cabinet forever and I can’t bring myself to eat. We are firm believers in using what you have on hand to make things, why buy stuff when you don’t have to? The wool in my scrap bag is from quilting crafts, thrifted cut up cashmere jackets, mens suits and old wool trousers. 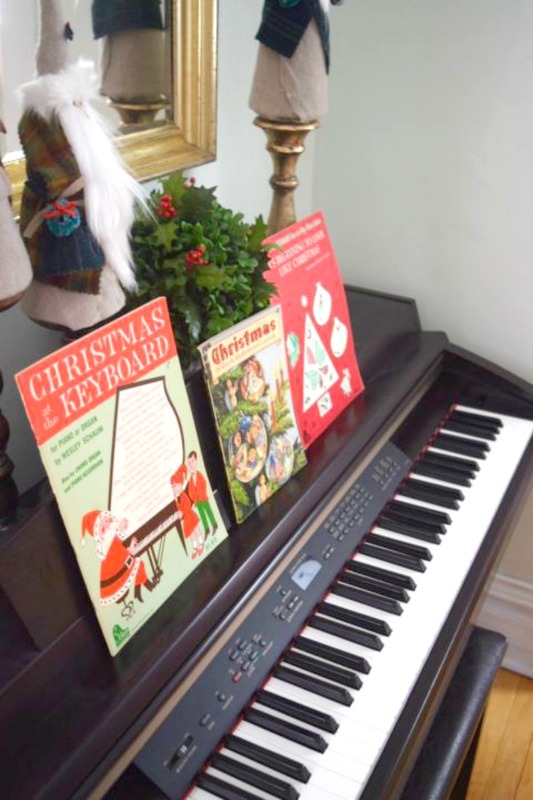 These pieces are very fine quality and I have had them forever because I couldn’t bear to part with them. How can you possibly throw away cashmere??? We are just getting started on our Christmas decor, but getting ready for St. Nick’s Day takes priority. Even though our kids are adults, I can’t help but keep the tradition going. The St. Nick’s feature wind blown beards and warm furry hats. Little scraps of wool cut into leaves and pinned in place with red headed stick pins give them an old fashioned festive look. A few tiny wreaths from the craft store here and there add character to his appearance. 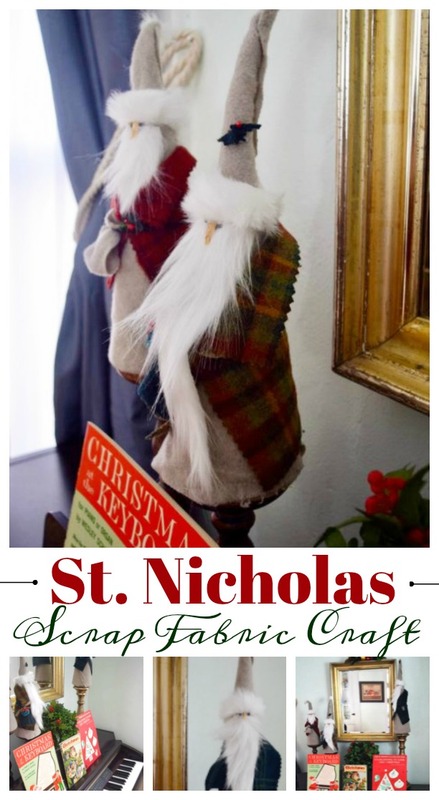 Here’s what you will need to make your own St. Nicholas. *Affiliate links used and show the same, or similar, items used. You can read our full disclosure policy here. Wrap the fabric around the tree base at a 45 degree angle, gluing as you work with the hot glue gun. Trim away excess at the bottom edge so the St. Nick will sit on a flat surface. Let the fabric extend above the tree top 3-4″ to make the pointed hat. Glue edges in place. Add a strip of craft fur 4″ down from the tip of the hat to make the hat trim. Glue a small piece of fur on the tip of the hat for trim. Stick the black headed pins in place for eyes just under the fur rim of the hat. Cut a long triangle of fur for the beard. Add the wooden nose between the eyes. Then place the beard, just under the eyes and nose. Fluff the fur out over the cut edges to look wind blown. Secure the facial features and beard with glue. To complete the St. Nick, cut a “robe” from a rectangle of wool fabric about 6″ x 8″. Use pinking shears to trim edges if desired. Fold the top of the rectangle down 2″, then wrap around the “shoulders” of the Saint Nicholas. Tie in place with a length of faux suede or shoe lace around the waist. Add a small piece of fabric at the belt for the gift bag, tie in place with the faux suede. Attach faux mini wreaths, holly berries and tiny scraps of green wool for holly leaves on the belt, hat or lapel to decorate. Finally, display on wooden candle holders or on a flat surface. Thanks to Salvage Sister and Mister for sponsoring this post! A big thanks to Jessica for sharing this wonderful Saint Nicholas Scrap Fabric Craft. If you make one, be sure to let us know! Let the fabric extend above the tree top 3-4" to make the pointed hat. Glue edges in place. Add a strip of craft fur 4" down from the tip of the hat to make the hat trim. To complete the St. Nick, cut a "robe" from a rectangle of wool fabric about 6" x 8". Use pinking shears to trim edges if desired. Fold the top of the rectangle down 2", then wrap around the "shoulders" of the Saint Nicholas. Tie in place with a length of faux suede or shoe lace around the waist. Linda, Thank you so much!!!!!! They are just too cute! I want one.